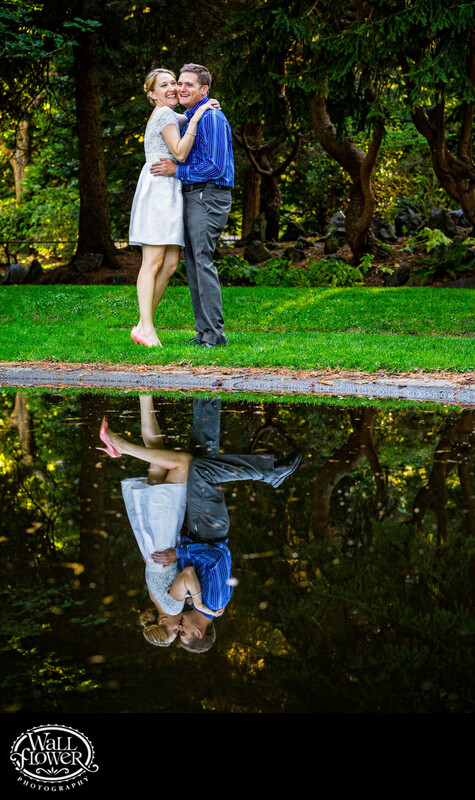 Our engagement portrait shoot at Point Defiance Park in Tacoma, Washington led us down to the Japanese Garden, where I shot this engaged woman and man standing by a pond with a glassy surface. I captured a fun series of photos of the two embracing and goofing around, including when they both kicked a foot back while kissing, and then laughed about it. Later, I combined two of the best photos into this quirky photo with a surprising, 'magical' reflection!